Jim and I agreed it was the best September skiing either of us have experienced in North America.� �I usually like to ski from Anvil Rock, avoid the half mile 400' gain to Muir across windswept conditions, but today Jim was too far ahead to stop.� Although there was mixed corn and hard dusty snow for the first 300' down (second pic,) we then found great skiing by staying as far right as possible (first pic) without heading into the Nisqually. 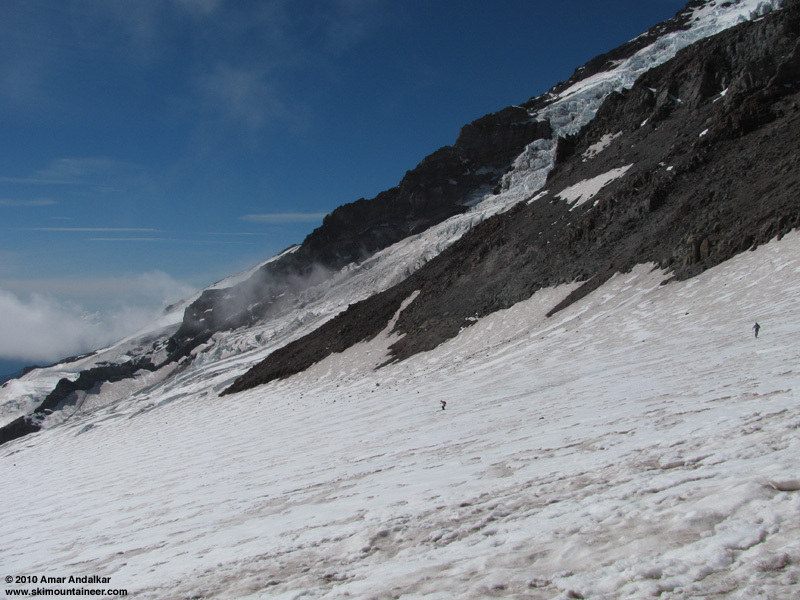 From 9800' to 7500' was 1-4" smooth clean corn on top of about six inches of consolidated September snow on top of the old hard stuff, fantastic for this time of year.� �We walked down 100' of scree to get to the nice 300-400' patch that ends below the Pebble creek trail crossing.� �It was smooth dusty snow that also skied very well.� �3000' (minus 100' scree) direct fall line skiing, light breeze, blue skies.� Yahoo! Now let the naysayers tell us about the better North American Septembers they remember? Nice Silas! This is encouraging having just read wolfs Muir whiteout report from the 12th day of the 9th month, aka yesterday as it stands today. Dude, you're an animal dude. Retirement looks great. ~24 years and counting for me, unless of course that old, mangled mega lotto ticket riding in my wallet is worth more than the lint balls it is currently producing. Probably time to find a barcode reader for that one. Keep the TAY TR's coming Silas. We were going to go that way on Saturday until the clouds swooped in big time. It looks like you had the better day. Jim and I agreed it was the best September skiing either of us have experienced in North America. From 9800' to 7500' was 1-4" smooth clean corn . . . I'll take that challenge, Silas! I skinned up to Muir just after 2pm, arriving just as you two began your descent, but you were too far west to exchange greetings. I agree that the ski conditions were quite good, but I didn't think that the surface was corn . . .� not sure what to call it, but it seemed to me to be not even proto-corn yet, a wet granular glue of some sort which needed a few more days of sun to become true corn. Some of the stickiest, highest-friction skinning I've done in a long time, but it did ski surprisingly well (not sticky while skiing) given how much effort it took to skin up it. They were sweet smooth turns, especially so for September, but definitely not the best September skiing for me: I had days with better snow conditions on the Muir Snowfield in September 1997, 2004, 2006, and 2009. 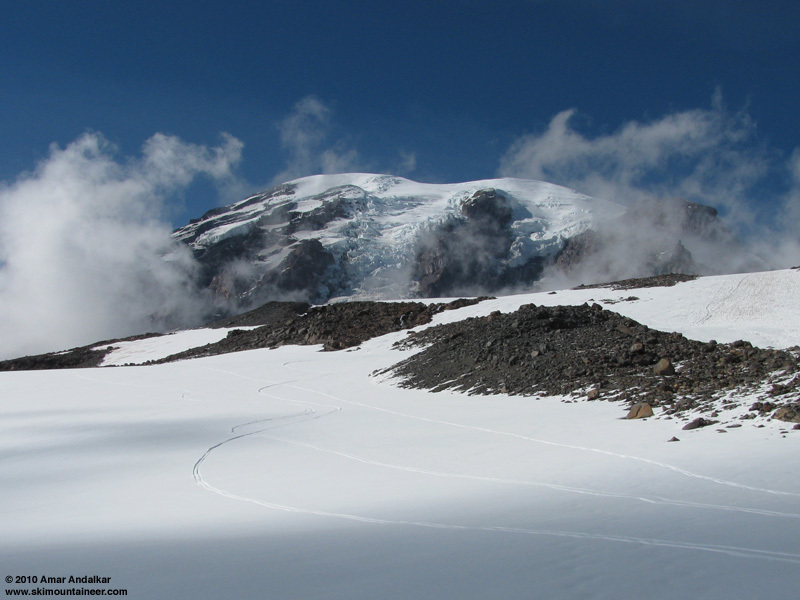 But my best September skiing was during the freakishly good September of 2008 on Mt Baker, with 3 summit ski descents in beautiful sunny weather with excellent snow conditions, each following recent snowstorms: 2 via Coleman-Deming on 9/13 (corn) and 9/23 (6-8" powder! ), 1 via Easton on 9/28 (corn). I intended to write TRs for those, but never did get around to doing so. Just saying so because you asked . . . I can't comment on the relative greatness of this September's skiing, cause yesterday on Muir was my first. And it was great. I left the car around 12:30 and my high point was in your second picture, Amar. (A couple of those tracks are mine.) I concur on the snow, which was pleasant but a little heavy in this section. I liked the lower part of the run best, where the new snow was getting thin. I was using waxless skis with experimental home-tweaked bindings, wearing lightweight hiking boots only. The bindings are heavy, but without boots I hit the trail carrying only ten pounds of ski gear. And the skiing was mighty, mighty fun. Silas, nice meeting you again. Given a little reflection I remember meeting you at a Crystal fest about five years ago, and again this spring at Alpental when I failed to see your skins that I must have walked within two feet of. Jim, I don't remember if I've met you before but it's good to start connecting real people to internet trip reports. And Amar, great to meet you. Thanks for all of your detailed reports and weather links. As for the skiing, I know those were my best September turns, but only because I only have one other September to compare them to. I think Amar's description of the snow was pretty accurate. Interesting that it was grabby at slow speeds but not once you got going a bit. I kept expecting to get throw over the handlebars and kept a super low defensive stance as a result, but never really felt the drag that I was waiting for. All in all, smooth, super fun snow. Can't wait for the real stuff to start falling. Hmm, I did not find sticky, high friction snow on the way up.� �Did skinning up later make that big a difference for you and the others?� �Did I have slipprier skins (Dynafit speedskins)?� �Was I too old or too tired anyway to notice?� Maybe the perfect weather and beautiful views distracted me.� �And scary moments each time the helicopter flew over with barrels of human excrement? I think Amar's description of the snow was pretty accurate.� Interesting that it was grabby at slow speeds but not once you got going a bit. Yikes, since I did not experience the grabbyness, was I going too fast for my age?� Maybe waxing my skis a bit at Muir made a difference or I was having too much fun to notice.� Apologies to readers of my posts, my snow type and quality assesment may be overly simplistic. Awesome Silas! You da man!! Thanks Silas for your trip report.� My wife and I went up the next day and enjoyed making smooth GS turns in September.